The UNESCO committee criticized the absence of a proper management plan and claimed that the project has caused damage to surfaces of the archaeological site’s 2000-year-old pyramids, so the lighting and sound systems have been removed. However, INAH says that it has not totally given up on the idea of lighting up Teotihuacan — which became a UNESCO World Heritage Site in 1987 — to attract more tourists and help bolster the local economy. Personally, I’ve never been a big fan of light and sound shows. I often find them to be somewhat garish and over-dramatic. Perhaps it would be a better idea to let groups of visitors into Teotihuacan at night so that they can see its pyramids as the ancients did — by the light of the stars and the silvery moon. As a mexican citizen that I am, I think it’s really a pitty that such beautiful and majestic buildings must remain unnoticed and in complete darkness during the night time. Teotihuacan it;s a beautiful city and deserves to shine not only in the day but through the nite. I hope that the mexican authorities will reconsider the project, and that some day in the near future we’ll enjoy the night view of this great city in all of it’s glory. Come on!! How about torches!!!!!!!!!!! Might be quite a “performance” type with a night tour by torch light!! Hope to walk among the pyramids one day!! I was at Teotihuacan in 1970, 71 and 72. I saw the show each year and was totally enthrawled by it and the complex itself. I liked the show so much I taperecorded it on casette and filmed as much as I could on old super-8 color film. I thought it was a very impresive show. When Charelton Heston came on saying” I am the Pyramid of the Sun, the giver of life. I swing my fire into the infinite and everlasting space of the universe”, the hair on my neck stood up. Agnes Moorehead voiced, “I am the Pyramid of the Moon. I have no light of my own. I get my light from the sun.” It tried to give modern impression of the history of this lost culture. I am sorry to see it go. It was a tremendous experience in my life that I will never forget. I saw the show in 1968 and it was magnificent. It is something I have never forgotten. 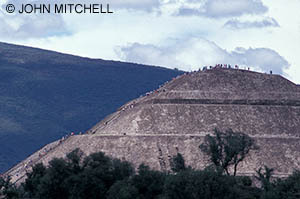 Climbing the Pyramid of the Sun and the Moon and then the light and sound show at night was a wonderful experience.